Taste test: These chips were super-tasty and, as with other Tim's chips, thick and super-crunchy. The taste was a lot like wasabi peas. The level of wasabi heat and taste varied a lot from chip to chip, as some had a pretty good heat and some had hardly any. 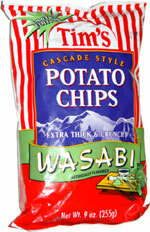 This was the first wasabi-flavored potato chip we ever tried. Another nice product from Tim's. 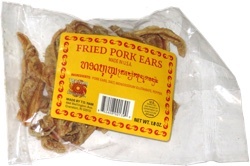 Smell test: Smells like oily potato chips, no wasabi.